I would like to welcome you to the 14th M100 Media Award Ceremony at the Potsdam Museum. We are delighted that you are all here to pay tribute to the journalist Deniz Yücel. As Turkey correspondent for the WELT Group, Deniz Yücel has repeatedly drawn the displeasure of the Erdogan regime to himself with is uncomfortable reporting – among other things on the Kurdish conflict and corruption in government circles. Deniz Yücel was arrested for alleged “terrorist propaganda” at the beginning of 2017 and spent a year in pre-trial detention without charge – more than 9 months of which in solitary confinement. And even in prison he fought undauntedly and consistently for a critical and independent journalism. This requires a lot of courage – and serves as a shining example at a time when autocrats and populists are threatening the values of a free and open society. Mr. Yücel, we want to pay tribute to you today for your courage and uncompromising spirit in the service of freedom of the press and we are very honoured that you have come to Potsdam to receive the prize. Deniz Yücel has been free again since February 2018, but the trial against him will continue. Maybe he will no longer be able to enter the home country of his family without being arrested. The price that he and other journalists pay to provide us with true news and reports is sometimes very high. In Turkey it is far too high these days. Over 150 journalists are in prison, dozens have left the country and are living in exile. Correspondents from German and European media are sitting in Turkish prisons or have had to leave the country. Many of the media in Turkey have been closed completely by the state or occupied by new and loyal personnel. Turkish journalists are to be brought to silence. In Turkey it is said these days: “The truth cannot be locked up!” With the M100 Media Award we want to remind of all those, who are in prison or were driven out of their homeland for their call for truth. But not only in Turkey the free press gets increasingly under pressure. US President Donald Trump recently reacted with an angry Twitter salvo to a book of revelations by the legendary US reporter Bob Woodward as well as the revelations of an anonymous government employee in the New York Times and called on Congress to tighten legislation against slander, therefore to restrict freedom of expression. The extent to which Donald Trump’s presidency has an impact on the current transatlantic relationship on the EU agenda, and whether the media – which, in addition to the threat posed by autocrats and populists, are increasingly facing economic challenges by new technologies – still have the strength and relevance to foster Europe’s unity and capacity to act. You have been discussing this all day today. And I hope you have achieved encouraging results. The award ceremony also draws an important line to our 25 up-and-coming journalists who are sitting here in the audience tonight. Last week, sponsored by the Federal Foreign Office and the National Endowment for Democracy, they were working at the Media Innovation Centre in Babelsberg, Alex TV and the Téléfonica Basecamp on the question of how journalism and political education can be carried further into the social networks. I hope that the workshop has brought you new insights and that you can realise your projects with this new knowledge. These young journalists are from Europe, the countries of the Eastern Partnership and from Russia, and thus partly from countries where freedom of the press is not always a priority. If they learn to counter fake news and hate speech on Facebook, Twitter & Co with true reporting to promote independent political opinion-forming, then hopefully the future of freedom of the press will not look as gloomy as one might expect at the moment. 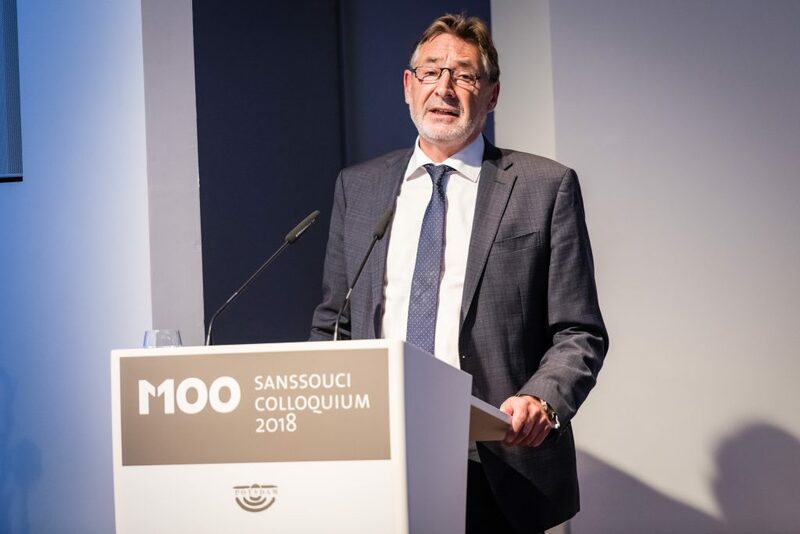 The Sanssouci Colloquium has become a fixed date in the annual calendar for many, and this also shows the quality of this event. I would like to thank the M100 advisory board and the production team again this year. For me, this event is the last as Lord Mayor of the state capital Potsdam. Therefore I would like to personally thank all participants, contributors and guests for 14 exciting years of M100. With this in mind, ladies and gentlemen, I wish you a beautiful, festive, stimulating and moving evening and now I would like to hand over the floor to Christian Lindner, Federal Chairman of the Free Democrats and Chairman of the Parliamentary Group of the Free Democrats in the German Bundestag.